However, if left untreated, dental disease can not only be painful and inhibit proper nutrition, but it can also lead to serious systemic issues that may threaten your pet's health before symptoms are noticeable. For example, oral bacteria that enter the bloodstream can damage your pet's kidneys, heart or liver. 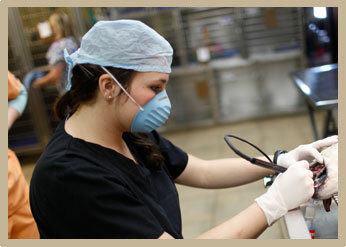 Simply stated, veterinary dental care is an important piece of your dog or cat's preventative health care program. It will not only prevent dental and systemic disease, but it also helps minimize the lifetime cost of care for your pet. We take the oral and dental health of your cat or dog very seriously and believe that dental care is an important piece of your pet's preventative care. The centerpiece of good dental care is a complete oral exam followed by a thorough cleaning. Dental cleanings include ultrasonic scaling with a tip made to clean below the gum line (PerioBUD scaling), followed by polishing and a mouth rinse, all of which is designed to remove plaque and slow its buildup. Should we find any issues, such as evidence of gum or tooth decay, gingivitis, or excessive plaque buildup, we will discuss this with you and provide treatment options. In general, we offer periodontal disease therapy, slab fracture repair, extractions and a wide range of services to treat dental issues common to companion animals. Dental care is not something that can be left to periodic visits with your veterinarian. Because plaque buildup—the primary cause of poor oral health—is a gradual process occurring throughout the life of your pet, it is important to practice good home dental care. As with humans, this means regular tooth brushing and in some cases additional steps may be necessary. Any member of the our staff can show you the proper method for caring for your pet's teeth as well as help you select the most effective dental products for your pet.